Biotoxin closures of shellfish areas are different than closures based on bacterial pollution, although both closures occur because conditions in the water make shellfish unsafe for human consumption. Maine’s Department of Marine Resources Public Health Bureau monitors several biotoxins produced by different types of marine algae known as phytoplankton. The types of phytoplankton include: Alexandrium, which produces the toxin that causes Paralytic Shellfish Poisoning; Pseudo-nitzschia, which produces the toxin that causes Amnesic Shellfish Poisoning; and Dinophysis, which produces the toxin that causes Diarrhetic Shellfish Poisoning. It's normal for biotoxin-producing algae to be present in marine water. They are usually at very low concentrations and pose no problems. During winter months, some phytoplankton cells turn into cysts which lie dormant in the ocean sediment. 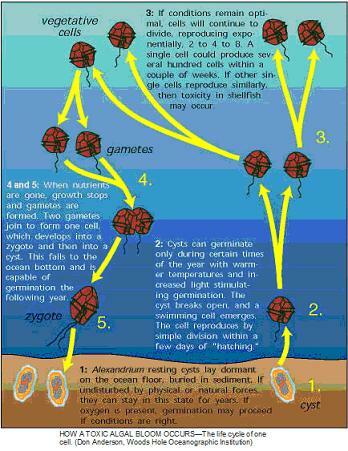 When water temperatures warm, the cysts begin to germinate (hatch). After germination, the swimming form of the cell emerges and divides. When environmental conditions are right (oxygen, light, temperature, etc. ), cells continue to reproduce and become concentrated, creating blooms known as “harmful algal blooms” or HABs. Toxic cells are consumed by shellfish that feed by filtering tiny organisms from the water. These shellfish include mussels, clams, and oysters. After the cells are digested, the toxin remains behind and can accumulate in the tissue as more toxic phytoplankton is ingested. This toxin is transferred through the food web when other species, including humans, eat the toxic shellfish. Harmful algal blooms in Maine typically occur between April and October, but the species of phytoplankton that causes Amnesic Shellfish Poisoning, Pseudo-nitzschia, has bloomed in recent years during winter months. The State of Maine, Department of Marine Resources Public Health Bureau tests coastal shellfish areas for biotoxins weekly, beginning in March and going through October, or later when necessary. Precautionary regional closures along the coast are implemented annually starting in May when the likelihood of biotoxin blooms increases with the temperature. These closures target species that are impacted by biotoxins more rapidly, as well as lower value species. Annual precautionary regional closures allow the department to focus its resources on monitoring certain shellfish and aquaculture sites which are of higher value. For most types of phytoplankton, when routine water sampling detects cell concentrations (in terms of numbers of cells per liter of water) that are known to produce toxins, sampling of shellfish begins. When shellfish samples are shown to have toxins in concentrations specified by the National Shellfish Sanitation Program, areas are closed to shellfish harvesting. Because shellfish become toxic more rapidly when they are exposed to Pseudo-nitzschia, the Department has made the decision to close shellfish areas precautionarily when ASP is first detected in shellfish meats. The areas are reopened upon additional testing, if appropriate. This approach will prevent the need to conduct recalls of product harvested between the initial toxic sample and follow up shellfish sampling. Paralytic Shellfish Poisoning (PSP) - Although it does not usually produce red water, Alexandrium is referred to as Red Tide. People usually display PSP symptoms within 2 hours of consuming impacted shellfish. Mild symptoms include numbness and tingling of the face, arms and legs, followed by headache, dizziness, nausea and muscular incoordination. Severe poisoning causes muscle paralysis and respiratory failure within 2 to 25 hours. Diaherretic Shellfish Poisoning (DSP) - As the name suggests, this syndrome manifests itself as diarrhea and abdominal pains. Nausea and vomiting may sometimes occur too. DSP and its symptoms usually set in within about half an hour of ingesting impacted shellfish, and last for about one day. Recovery usually occurs within three days, with or without medical treatment. Amnesic Shellfish Poisoning (ASP) - Symptoms include vomiting, nausea, diarrhea, and abdominal cramps within 24 hours of ingestion. In more severe cases, neurological symptoms develop within 48 hours and include headache, dizziness, confusion, disorientation, short-term memory loss, motor weakness, seizures, profuse respiratory secretions, cardiac arrhythmias, coma, and possible death. Short term memory loss can be permanent. It is important to know when shellfish are safe to collect and eat. Toxic shellfish can be found in clear, clean and remote waters off the coast of Maine. Toxic shellfish do not look or taste any different from non-toxic shellfish and toxins cannot be cooked out. 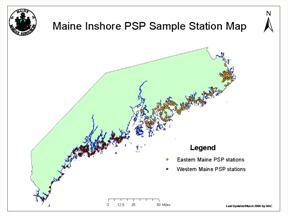 You can find out whether it is safe to harvest in a specific area by visiting http://www.maine.gov/dmr/shellfish-sanitation-management/closures/psp.html. The above information is not in reference to bacterial closures, which are caused by pollution instead of biotoxins. Bacterial closure information can be found at http://www.maine.gov/dmr/shellfish-sanitation-management/closures/pollution.html. For recreational harvesters, the areas of interest in the Biotoxin Closure table are Areas 100-A (South Berwick to Bristol), 100-B (Bristol to Stonington), 64-A (Stonington to Machiasport), and 64-B (Machiasport to Calais). The species of shellfish impacted by each closure are listed in the right-hand column of the closure notice table. If the species is not indicated in the right-hand column within the area you wish to harvest, that species is approved for harvest, subject to any additional restrictions placed on the harvest because of bacterial contamination or conservation closures implemented by the local municipality. However, all harvesters are encouraged to open the notice and read the closures carefully or call Marine Patrol to be sure they are harvesting from an open area. Recreational harvesters should also check the Bacterial Closure table to determine if the area they are interested in is closed or subject to a harvesting restrictions because of bacterial contamination. While no state license is required for recreational harvesting, some municipalities require a municipal license for recreational harvesting. Daily limits for recreational harvesters vary by species. Information can be found at http://www.maine.gov/dmr/shellfish-sanitation-management/shellfishidentification.html. Municipalities with shellfish conservation ordinances may further restrict shellfish harvesting. A list of municipalities with shellfish conservation ordinances can be found at http://www.maine.gov/dmr/shellfish-sanitation-management/programs/municipal/ordinances/towninfo.html. Please contact the municipal office in the community you’re interested in to confirm the need for a recreational harvester license and for additional information on their shellfish conservation ordinance.